This week, with Valentine's Day less than a week away, I wanted to do a fairy tale that would be fun for the holiday, so I chose The Frog Prince. I think the Frog Prince is a fun little tale, and I have always been fond of frog princes for Valentine decor. You can see my little frog prince candle holders below. 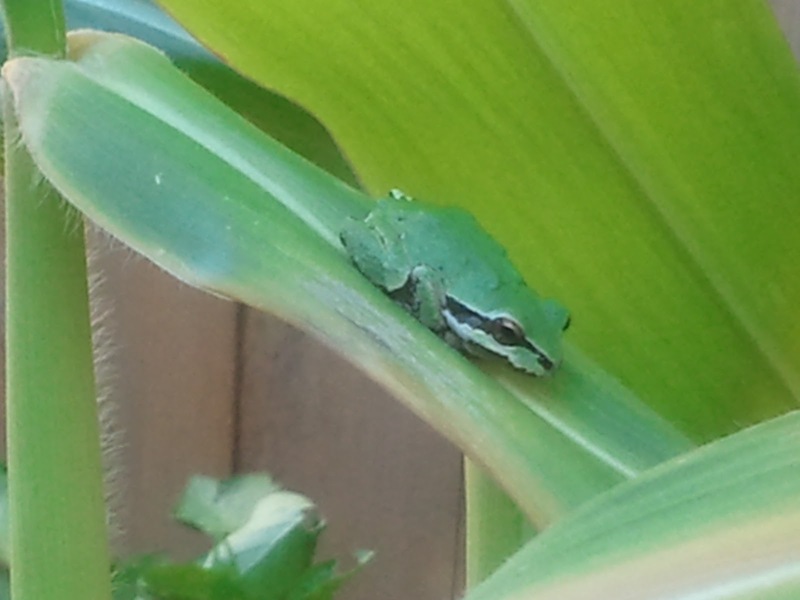 We have little frogs all through the garden, such cute little creatures. Maybe a prince in disguise? There once was a very beautiful princess. She spent most of her days playing down by the well with her golden ball. One day she was playing with her golden ball, tossing it into the air and catching it, and accidentally the golden ball fell into the well. She peered into the well, but the water was so deep she couldn't even see her golden ball. She became very sad, and began to cry. Just then, out of the water, appeared a frog. The frog asked the princess why she was crying. The princess told the frog how her favorite golden ball had fallen into the well, she asked the frog if he could get it for her. The princess said she would give the frog her ruby ring, but the frog had no use for a ring, she offered the frog her string of pearls, or her crown, and the frog had no interest in either. The frog told the princess that he would go to the bottom of the well and get her golden ball, if she would promise to let the frog sit with her at dinner, let him share her plate and cup, let him sleep on her pillow, and then kiss him good morning. The princess really wanted her golden ball, so she agreed. The Frog went to the bottom of the well, and brought up the princesses golden ball. The princess was so happy to have her ball she ran off back to the castle, and left the little frog behind. The frog called after her, but she was already too far, and could not hear him. That evening at dinner, the princess was dining with her family, when there was a knock at the door. The little frog asked to be let in, and said that the princess had promised him he could be her dinner guest. The King asked his daughter if it was true, and she said yes, she told the king that she didn't want to have dinner with the frog, and that she thought he was disgusting. The King reminded his daughter that she gave her word to the frog, and that the most precious possession anyone has is his good word. He reminded her that as a princess of the kingdom, keeping her word was very important, so reluctantly the daughter obeyed her father, and let the frog dine with her, and share her plate and cup. Soon it was time for bed, and the frog reminded the princess of her promise to let him sleep on her pillow, again she was angry, but her father insisted again that she keep her word. So the princess brought the frog to her room. The frog asked the princess to lift him to her pillow, but she became angry, and said she didn't want to let a gross frog sleep on her nice pillow. She became so angry that she threw the frog across the room. The princess felt very bad that she lost her temper, never had she hurt a creature before, she went over to see if the frog was alright, but there he lay on her floor. She lifted the frog, and told him that she was sorry and tried to revive him. She bent down and gave him a little kiss, and all of a sudden the frog turned into a handsome prince! The prince explained to the princess that he had been turned into a frog by an angry fairy, and that only a kiss from a true princess could break the spell. They soon fell in love, and became married, and lived happily ever after. In the Grimm's version of The Frog Prince, the frog turns into a prince as soon as the princess throws him against the wall, and there is no kiss to break the spell. Also in the Grimm's version of this story, the prince brings the princess to his Kingdom, and his faithful servant Henry, who was so sad that his master had been turned into a frog, had three iron bands put around his heart so his heart would not break. As Henry is bringing home the Prince and his new bride, one by one the bands fall off because he is happy again. There isn't much back story on Henry or even how the prince came to be turned into a frog, I had never read the Grimm's version of this story, until I was preparing this post. I had only read American adaptations that include the kiss, and no story line for the faithful servant Henry. As a child in the 80's, I enjoyed the Fairy Tale Theater fairy tale show, one of my favorite episodes was The Frog Prince, starring Robin Williams as the Frog Prince. I had a hard time deciding how I would make the frog prince this week, I couldn't decide between a paper craft, or a sewn doll or needle felt. I decided to try needle felt, and I thought I would try needle felting around a cotton pipe cleaner armature, so I could move his arms and legs. I decided to take a picture of the wool core wrapped around the pipe cleaner arms and legs. I decided, after promptly breaking a needle, that I am not fond of needle felting over a wire frame, you have to be much more careful while needle felting to not hit the wire. Here is how he turned out, not quite what I envisioned at the beginning, but sometimes needle felting goes that, and the little fellow is growing on me. He is holding the princesses golden ball. I gave him little froggy spots on his back as well. My frog prince will join my growing cast of fairy tale characters on the book case. I would love to hear what version of this story you are most familiar with, the original Grimm's version or the version with the kiss. Anyone else remember Fairy Tale Theater? There is still time to enter my Jane Austen Giveaway which ends Sunday February 12th at Midnight. I prefer the version with the kiss, being a romantic. Grimm certainly had some dark ideas. Wouldn't you like to know what those brothers were like in real life? When I was little we had Shari Lewis. I still love Lambchops! Another great one April. You should make a little e-book of them all once you're done with the series. Happy Whimsical Hearts & Sherri, thank you! Thanks for stopping by and leaving such nice comments. Love your frog!! And your fairy tales unit has been so much fun to read about! Love this fairytale and I adore your super cute frog!!! Thanks so much for sharing your creativity with us at Sharing Saturday. Hope to see you again this week.